Do you want custom printed T-shirts? Well, you can order them right here! Eurologo has beautiful T-shirts (100%cotton, 135 gr). We sell T-shirts for ladies, gentlemen and also children. We can custom print your logo or a text on these shirts. The shirts for the ladies and gentlemen are available in sizes S, M, L, XL, and XXL. You can order your T-shirts in the following colors; orange, fuchsia, yellow, white, red, bright blue, Dark blue, black and green. The T-shirts for kids are available in sizes 4-5, 6-8 and 10-12. You can order kid’s T-shirts in the colors yellow, orange, red, pink, bright blue, black, green and white. 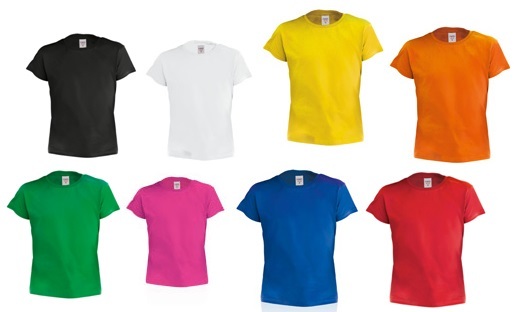 We can print an image or text on the back or the front of the T-shirt, in one or multiple colors. Are you curious to see if we can print your logo on these T-shirts? Send us an E-mail with the image you’d like to have printed. This way we can decide on the price and assess if the image could be printed. You will then receive an e-mail from us with the price. You can order these T-shirts starting with 250 pieces. Within Â one order you can choose different colors and sizes, so you can print them for multiple audiences. The delivery time for these T-shirts is about 3 weeks. 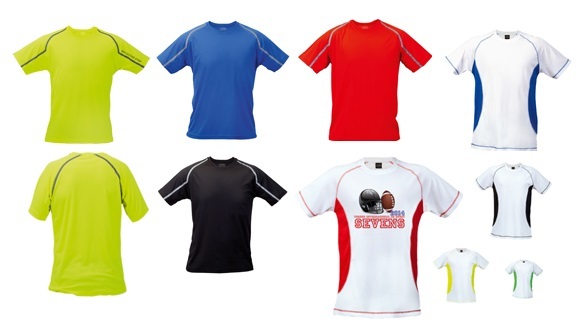 Even for the sporty types we have T-shirts! These shirts are lightweight, breathing polyester (135 gr). E can print your logo/name on the front or the back of these shirts, in one or more colors. them in sizes; S, M, L, XL or XXL. The colours available are blue, white, black, or white with colored sides. Are you looking for different model shirts, different quality shirts, hoodies, sweatshirts, polo shirts, body warmers, fleece shirts, caps, hats etc.? contact us and we’ll see what we can do for you.